Your method and map insinuate that Georgetown and Dupont are less safe than Edgewood or Benning, which is certainly not the case. 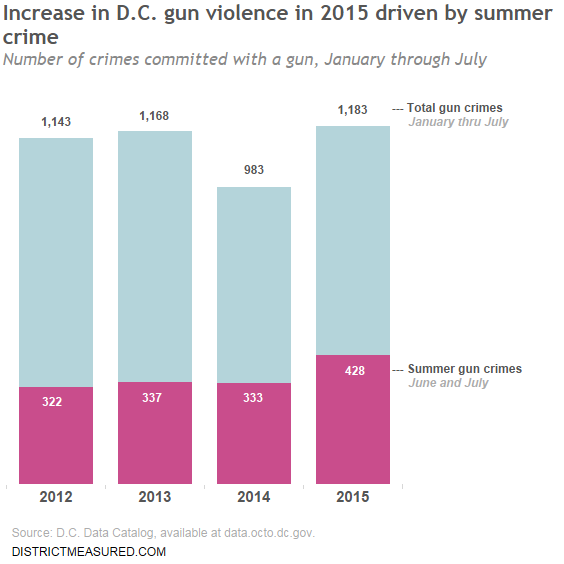 It would probably be more useful/meaningful to compare percent increases/decrease, as well as ranking each neighborhood in 2014 and 2015 by raw number of gun crimes and measure the change in rank. Additionally, I would venture to say that the increase in gun violence is due to gentrifying neighborhoods, which increases opportunities for armed robberies/home invasions/muggings. It is obviously due to other factors as well, but without seriously studying the data, it is imprudent to venture any other guesses. Yep, using percent change or ranking neighborhoods by raw crime numbers would be another way to look at the data. Each method tells a different story. One thing to note, and this is important, this map does not line up with the police district map, which makes it somewhat suspect. For example you mention Takoma as someplace where there has been a steep increase, but that has not really been the case at all,, Takoma is part of the 401 police service area (with Shepherd Park and Colonial Village), yet you have it grouped into something else, which has seen an increase, but is considerably smaller. My advice is quit relying on these old maps. This map is not lining up to the police service areas, it uses very outdated boundaries. No offense, but this does not really fall in line to how the data itself is collected if you pay attention to how it is actual geographically mapped in terms of crime data. Police Service Areas actually do make far more sense when analyzing crime data, as they are more reflective of neighborhood boundaries and groupings. For example Takoma is mapped with Shepherd Park, and Colonial Village, instead of Manor Park and Brightwood. If you actually are familiar with the neighborhoods, this indeed makes a bit more sense. Likewise, they are also more reflective of how the crime data is collected, which is not based on this map, but on Police Districts, subdivided by Police Service areas. If you dig deeper, you will notice for example, the problems are not so much in Takoma, as they are in Brightwood and Manor Park. My advice is to go back to the drawing board and use the Police Service Area maps, because right now from a data analysis perspective this really is a fail. It would help you better identify where the real issues are by area. But also provide better analysis. As it stands this lacks a real understanding from a quantitative, qualitative, and data grouping perspective. Yes, you’re right, we used neighborhood clusters not PSAs. We do lose some precision when we look at groups of neighborhoods. For instance, the neighborhood cluster of Petworth/Brightwood Park/Crestwood had one of the biggest crime increases, but my bet is not a lot of that is from Crestwood.